Gorgeous, right? Instead of the grey gradient, I used bright green. But otherwise, mine is practically identical… and I love it! I absolutely love this! I think it’s one of my best manicures, don’t you?! 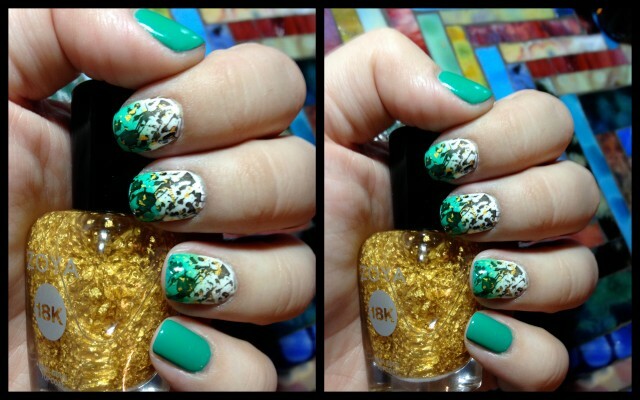 This entry was posted in Nails and tagged bundle monster, china glaze four leaf clover, gradient, HK girl topcoat, manicure, nail art, nail stamping, nails, opi, splatter, zoya gilty, zoya purity on November 27, 2013 by doctorcrafty. I’ve been wanting Marc Jacobs Petra since I saw the collection at Sephora. It’s such a stunning color, and I haven’t seen any other similar colors. It’s this amazing brown with copper/ bronze shimmer that has some purple-pink shades in certain lighting. Amazing! The above pictures were taken inside next to a tabletop lamp. The left image is without flash, and the right is with flash. You can see a bit of the purple tinge with flash. 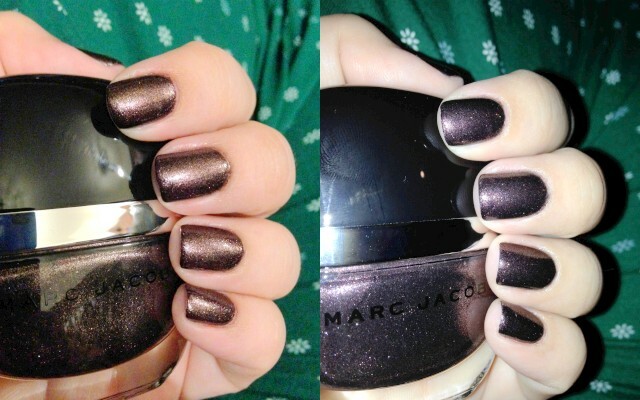 This entry was posted in Nails and tagged manicure, Marc Jacobs Petra, nail polish, nails on November 20, 2013 by doctorcrafty. I needed glitter detox after my last manicure. So I was planning on doing a lovely matte grey…. theeeeen I ran across one of my all-time favorite polishes. 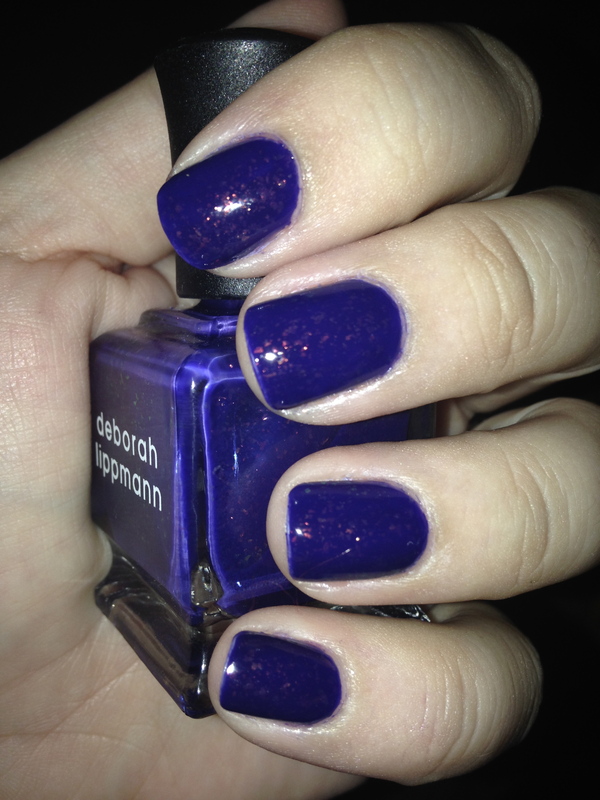 Deborah Lippmann’s Ray of Light – a ridiculously gorgeous royal blue semi-jelly filled with multicolored flakies. I lusted after this polish for months before biting the bullet and spending the $$ for a Deborah Lippmann polish. I’ve actually only worn this once before because when worn alone, it takes forever to dry. Plus, layering the flakies detracts from this particular polish. I recently found an amazing royal blue polish that almost identically matches the base jelly color. My OPI Eurso Euro is a great match! So I had to try it again! And I was most definitely not disappointed! 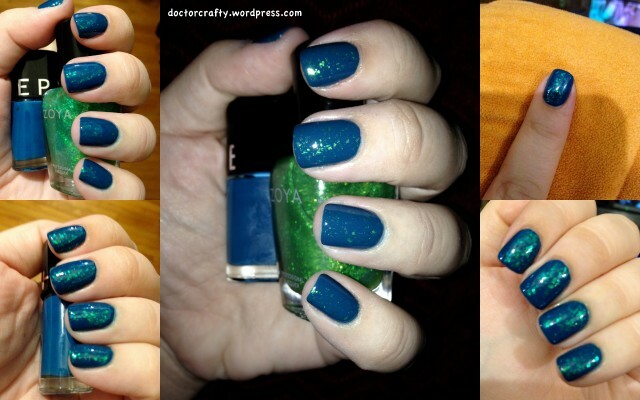 This entry was posted in Nails and tagged deborah lippmann, eurso euro, flakies, manicure, nail polish, nails, opi, ray of light on November 18, 2013 by doctorcrafty. Anyone who does a lot of manicures is at risk for really dry hands. All those frequent changes in nail polish and exposure to acetone can tear up the skin around your nails. In addition to that, I also work in a hospital so I need to wash my hands a lot and use that drying alcohol-based hand sanitizer. And I have eczema, which basically means I have very sensitive dry skin at baseline. 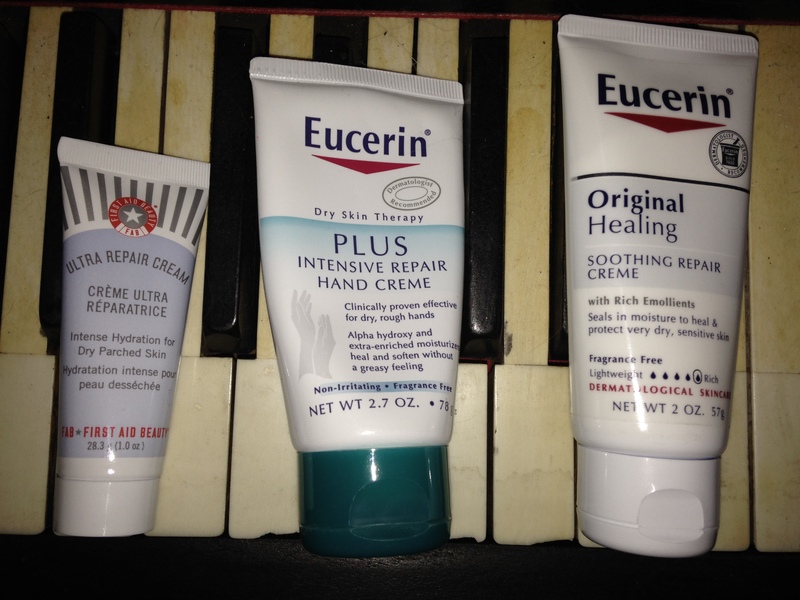 This entry was posted in Beauty, Nails and tagged cuticle care, eucerin, first aid beauty, hand moisturizer, moisturizer, skin care on November 15, 2013 by doctorcrafty. There’s a lot going on with my most recent manicure. 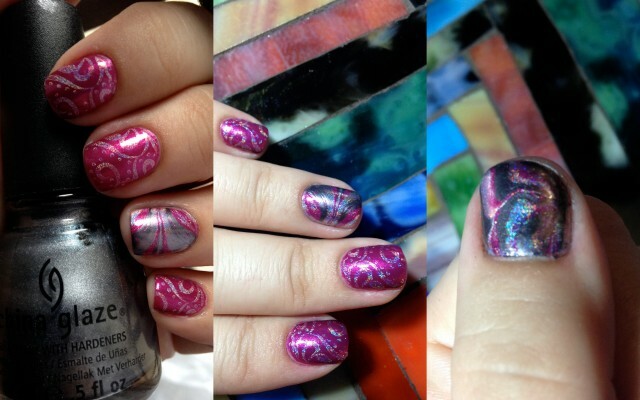 Shimmer, holographic, and sparkle with stamping and marbling… I may have gone on overload here. It’s like a manicure on crack. I like it though (the manicure, not crack). This entry was posted in Nails and tagged china glaze, color club, essie, holographic, jamaica me crazy, konad, manicure, nail polish, nail stamping, nails, sparkles, water marbled nails on November 15, 2013 by doctorcrafty. I love, love, love the flaky topcoat effect. I especially like it mattified over a dark base color. 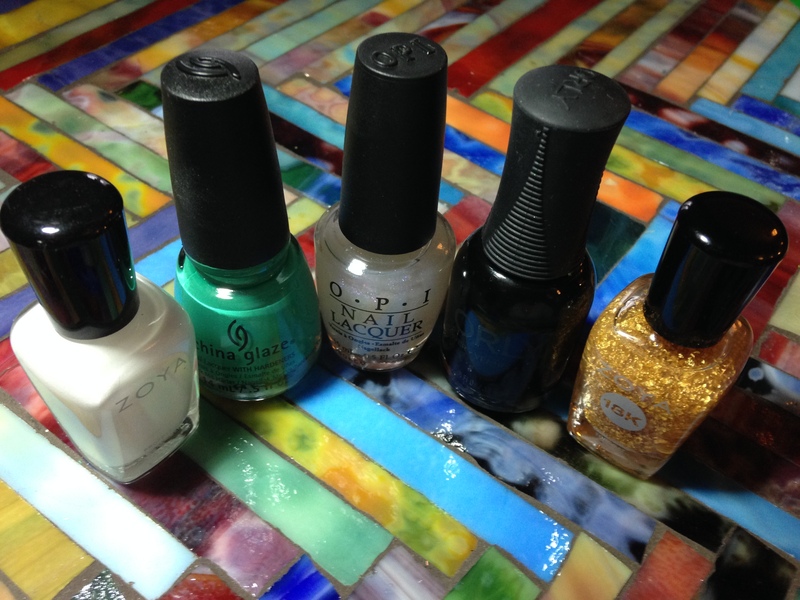 I bought China Glaze’s Luxe and Lush and was super excited to try it out. I layered it over a dark grey polish and then used a matte top coat. It was absolutely awful. The “flakes” were more like shards of glass that just would not lay flat, the formula was thick and hard to apply, and it just wasn’t as pretty as I imagined. Anyways, I don’t have a picture of that awful attempt because I couldn’t stand to have it on my nails for very long! Second attempt – I purchased Zoya Opal, which is exactly what I wanted! Smaller, thinner flakes that lay flat, look amazing, and are really easy to apply. Opal is a clear with slight greenish tinge and small blue-green opalescent flakes. It applies so easily, no need to dab your nails or even go back with a second coat. Love this polish! 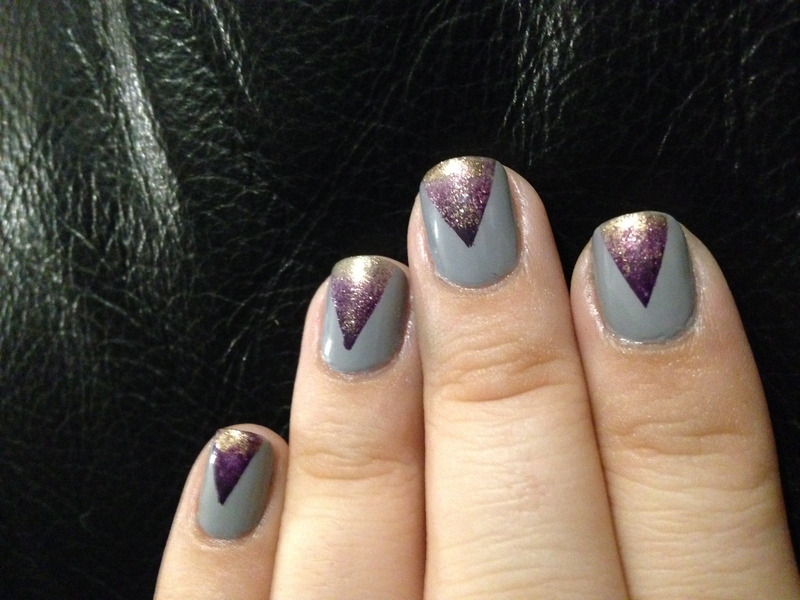 This entry was posted in Nails and tagged flakies, manicure, nail polish, nails, sephora color hit, zoya, zoya opal on November 11, 2013 by doctorcrafty. … no, that’s not a new term for vajazzling. It’s my new manicure of course 😉 And I’m obsessed! I can’t stop looking at it – I think it’s a real win. This entry was posted in Nails and tagged gradient nails, manicure, nail polish, nails, opi, opi vant to bite my neck, orly, orly luxe, orly purple poodle, seche vite topcoat, tape manicure, zoya, zoya carey on November 6, 2013 by doctorcrafty.